The Cerik raid on supernova-damaged Earth was a failure, but with a pair of humans in his claws, the leader hoped to breed a new race of slaves to replace the Builders, their technologists, that they had wiped out in a fit of revenge. Born of necessity, this pact between Abe and Sharon of Texas and the Cerik, was the genesis of the U’tanse, a psychically gifted splinter of humanity—trapped by violent masters and made to be slaves on a poisonous world. James, the first boy born without telepathy in a world where everyone else could read him, has to save the life of a girl who was too telepathic. Karl, abandoned to die as too expensive to rescue, has to survive without being detected—no free U’tanse could be tolerated! Debbie, sent off to Festival where girls were swapped to keep inbreeding low, has to choose between a new life with another clan, or to leave with a strange man who offers an alternative on a secret project. 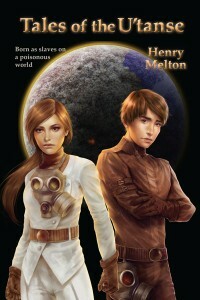 Beginning with Star Time, Henry Melton is crafting a tale of human destiny, on Earth and across the stars—The Project Saga.